When I was a kid, my parents once let me put frosting on pancakes. I think it was a special occasion, with frosting left over from someone’s birthday cake, and it was definitely a one-time thing. But after that breakfast, I was ruined. Nothing else could ever compare. In case you haven’t had the pleasure, let me just tell you right now: pancakes with frosting are the epitome of the good life, the breakfast of hedonists, the ultimate “treat yo’self” meal (Parks & Rec style). I got a bunch of carrots last week because I was planning to make my fiancé Ben a carrot cake for Valentine’s Day. He loves carrot cake and I’m coming around to it, as long as there aren’t any raisins involved. However, Valentine’s day came and went, and we were both overcome by snowstorm-induced laziness. 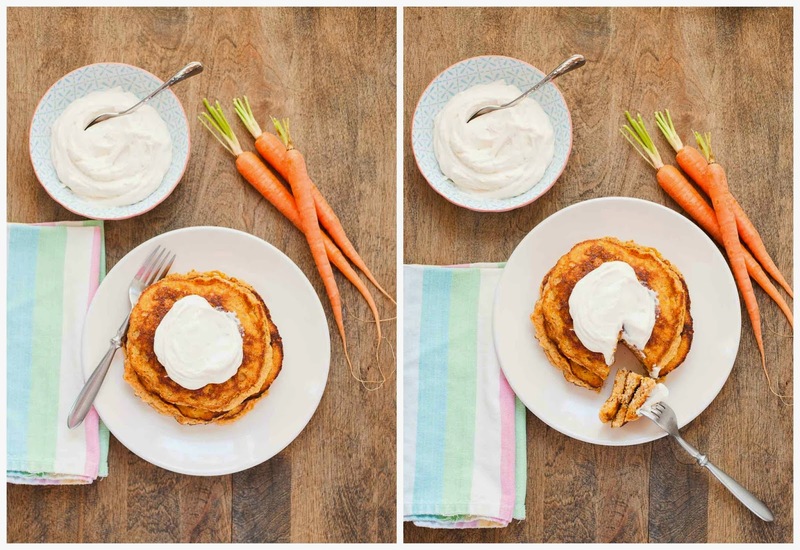 When I woke up this morning with a hankering for a big breakfast, and saw not much else besides that bunch of carrots and 3 lonely eggs in the fridge, I knew paleo carrot cake pancakes were the only way to go.This maple whipped cream cheese is a lighter version of a classic cream cheese frosting, made without butter and sweetened only with maple syrup. It’s delicious, and made my dreams of once again dining on pancakes with frosting come true. While the pancakes are paleo, this frosting does contain dairy. If you’re looking for a paleo alternative, you could top these with coconut whipped cream or creamy cashew icing. You could also enjoy them as-is, drizzled with maple syrup or honey, or spread with a little coconut butter. 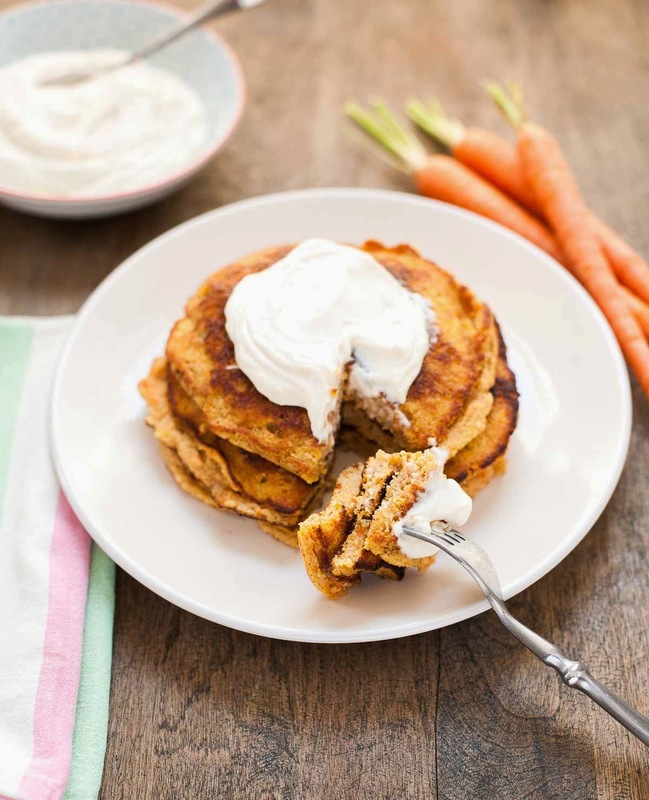 The carrot cake pancakes are adapted from my paleo pumpkin pancake recipe. Both recipes produce pancakes that are wonderfully fluffy because the eggs are separated and the whites are beaten until they hold medium peaks. The puffy whites are then folded into the rest of the batter, making it extra light and airy. I learned about this soufflé-inspired pancake technique from Laura’s recipe at Blogging Over Thyme, and it’s definitely worth the extra five minutes! I don’t think I’ll make regular pancakes ever again. I want to say I’ll never make pancakes without frosting ever again, but that might be going a bit too far. 1/4 teaspoon vanilla extractPreheat the oven to 200 degrees or its lowest setting so you can keep the pancakes warm later. Whisk together the almond flour, tapioca flour, baking soda, cream of tartar, spices, and salt in a large bowl. Beat the egg yolks, grated carrots, orange zest, honey and vanilla in a small bowl or two-cup measure. Place the egg whites in the bowl of a stand mixer fitted with the whisk attachment, or in any large bowl if you plan to use a hand mixer. Beat on medium-high speed until the whites hold medium peaks (when you lift up the beater, the tip of the peak should fall over while the rest of the peak holds its shape). Heat a couple of teaspoons of ghee or coconut oil in a small skillet over medium heat (or use two skillets at once so you can cook the pancakes faster). When the pan is hot (a droplet of water should dance vigorously across the surface), add about 1/3 cup of batter, smoothing out the top a tiny bit with a spatula to help it form a circle. Cook for 3-4 minutes, or until bubbles are reaching the surface in the middle of the pancake, and carefully flip (a slotted metal spatula is best for this). Cook for about 2 minutes on the second side, and then transfer to an ovenproof plate and keep warm in the oven. Add additional ghee or oil if the pan looks dry, and cook the remaining batter. You may need to adjust the heat slightly if your pancakes look too dark and/or cook them slightly longer on the first side if they are difficult to flip. While the pancakes are cooking, make the maple whipped cream cheese. Put all the ingredients in the bowl of a stand mixer fitted with the whisk attachment and beat until smooth. 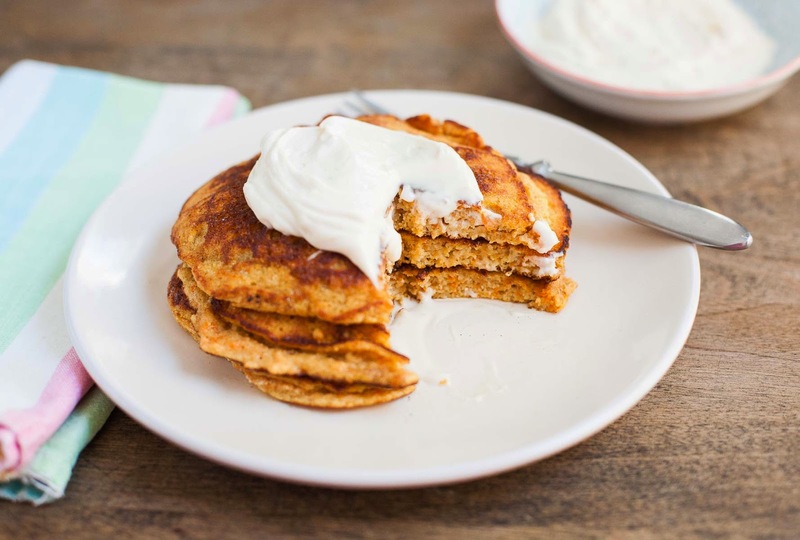 Serve the pancakes hot, topped with the maple whipped cream cheese. Becky, you’ve done it again! This recipe is fabulous! 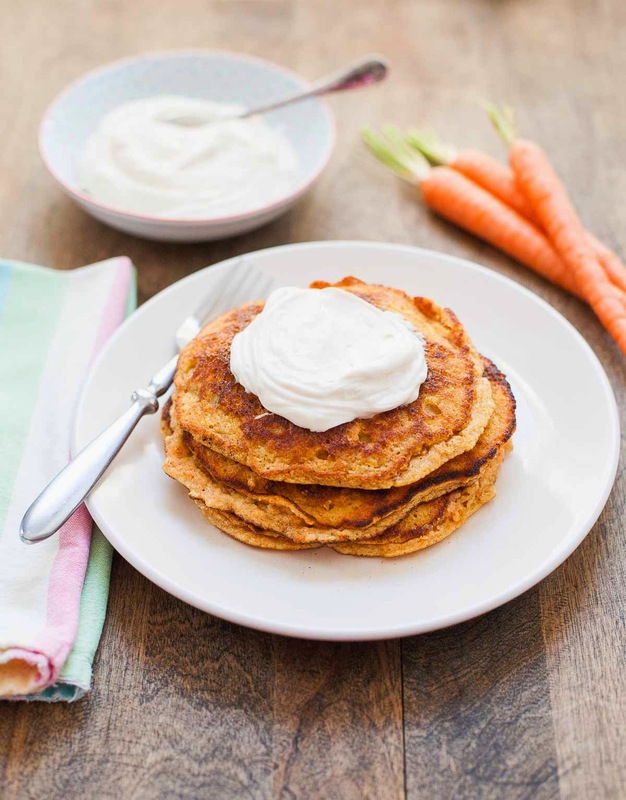 I was looking for a simple pancake recipe on your site to adapt to a carrot cake style pancake, but you hai Justin quattro o aas lopkingm forse, and more. 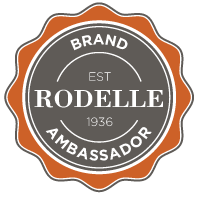 I am sooooo glad I found your blog! 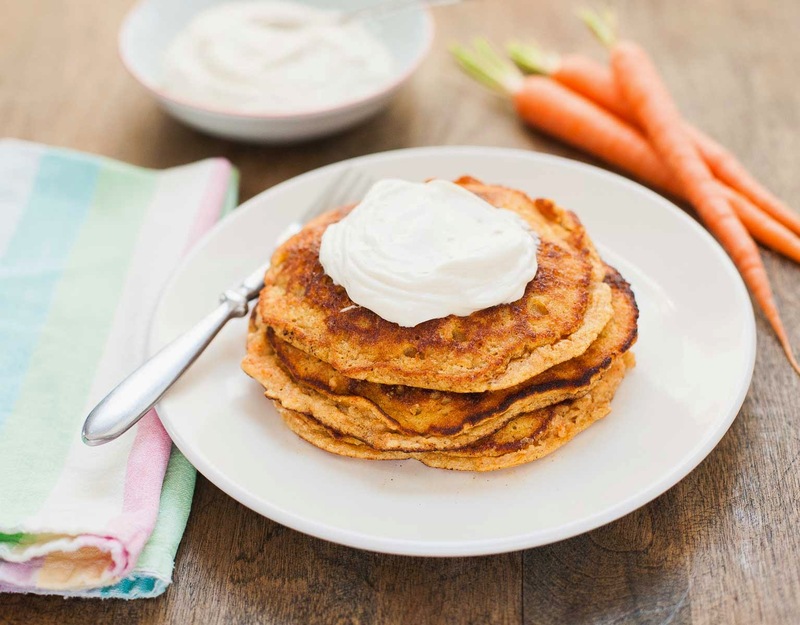 I looooove carrot cake and pancakes and cream cheese so ya…I need dis! I never thought of making cream cheese frosting with maple syrup, great idea! We usually make breakfast for dinner at least once a week. I know my girls would be delighted with these pancakes! Thanks, Katie! I think I might make breakfast for dinner a weekly event, too.